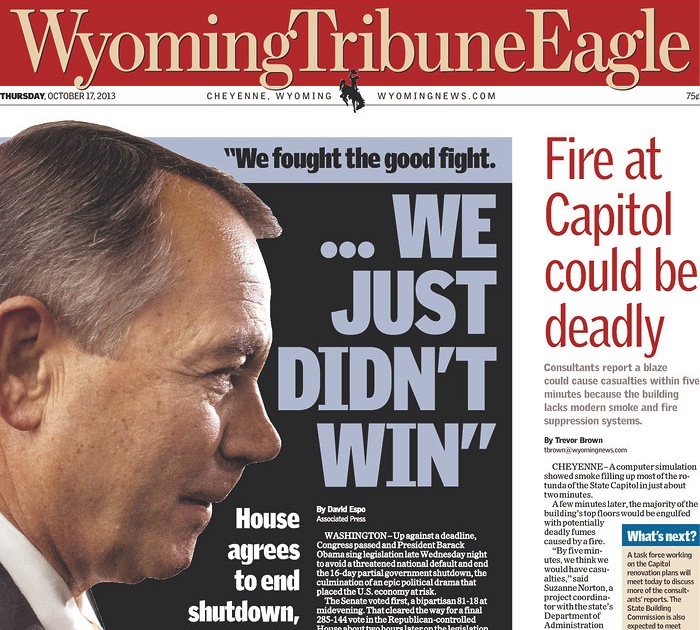 The fact is, John Boehner has made a deliberate choice all along in his speakership. You can moan all day about leadership and and herding cats, etc. But he has made the choice that his slavish devotion to the Hastert Rule is more important than anything else … more important than the financial health of the country, even the globe. His choice of requiring a majority of the majority on every single vote continues to give unprecedented power to a relatively small minority in his party. He’s made a choice letting roughly 12% of the House drive the entire government. That’s all it is – a choice. There’s no law, rule or even recognized precedent for that. He’s taken the (occasional) practice of one of his predecessors and turned it into something more important than the law of the land. All he needs to do is stop, and everything immediately goes back to normal but for the screaming. I’ve never to be politically sophisticated but I did have a manipulative mother whose upbringing required me to develop survival skills in interpreting the underlying motivations of others. Regarding John Boehner’s recent handling of the debt crisis, it seems to me by having the balls to let the extremist Republican element in the House play out their power play, while appearing to support them, has resulted in their demise. This greatly enhances his ability to control them in the future, which he managed without appearing to undermine their effort and, thus, gives him a much stronger hand in dealing with Democrats and puts the balance of power within their party back in the hands of their establishment. The biggest winners in this show are Boehner and Mitch McConnell, who for his part and all at once, just neutralized his primary Tea Party opposition and his his eventual Democrat opponent, Allison Grimes, who has based her campaign on his perpetuation of gridlock. These guys didn’t get to where they are by lacking in Machiavellian skills! I just can’t believe that this Speaker and his party will move on from this with no resignations, no apologies and no responsibility. This is an utterly disastrous event for the Republican party and the stories we read state that the Speaker’s position is not in question? WTF? Previous Previous post: A Breakthrough With Iran?